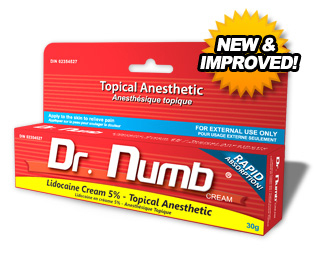 Dr. Numb Cream is a topical anesthetic numbing cream consisting of 5% lidocaine (the highest amount allowable). It is made with pure lidocaine. Dr. Numb uses water-based solutions. Therefore Dr. Numb cream doesn't interfere with the ink or the skins elasticity, making it safe to use for a painless tattoo process. Because Dr. Numb is pure lidocaine at its highest concentration and water based, it will completely numb the skin right away for a painless tattoo. It works great for relieving the pain associated with the tattooing process and numbing the pain of piercings. Dr. Numb Cream - topical numbing cream works by blocking nerves from transmitting painful impulses to the brain. After applying a thick (quarter inch) layer of the cream to the area to be tattooed, cover the cream with saran wrap for at least 30 minutes to give enough time to ensure a painless tattoo. Once the air tight bandage has been removed, the skin will remain completely numb for at least two hours. Dr. Numb is the SAFEST NUMBING CREAM to be used with tattooing. It does not interfere with the ink, it does not cause any side-effects, and with proper use will have a numbing effect of UP TO 4 HOURS! You don't have to endure long hours of conquering the pain of tattooing! Get your tattoos done quicker, thus lesser trips to your tattoo artist!